So, as our fearless leader nicely put it, it's Ubuntu Follow Friday! This last couple of days in the Community team we've been looking at some of the ways to spread out the word about different areas of contribution in Ubuntu, share our excitement and reach out to a bigger audience. We've been reviewing and reviving some resources we already had and we've been creating new ones, and in the case of translations I just thought I'd give a heads up to everyone about them. Check out our Facebook page at http://www.facebook.com/ubuntu.translators and make sure to 'Like' us to keep in touch! In less than two days we've already got more than 600 fans, so now it's your chance to also show your support for the awesome work of Ubuntu Translators and to stay in touch with translations news. Feel free to upload your pictures and videos related to translations, such as translation jam photos, and comment on our wall as well! Twitter - If you use Twitter, you can subscribe to the ubuntul10n group to share thoughts and announcements in real time about everything related to translating Ubuntu. 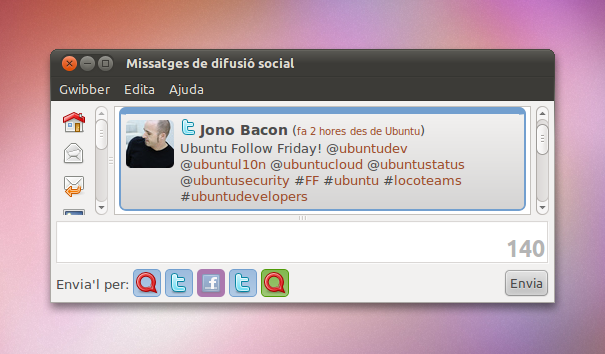 You can use @ubuntul10n, to send notices to the group, or the #ul10n hashtag for your related tweets. Identi.ca - If you use identi.ca, you can subscribe to ubuntul10n to follow thoughts and announcements in real time about everything related to translating Ubuntu. In addition to @ubuntul10n, you can also use the !ubuntutranslators, !ubuntu-l10n, !ul10n or !utranslators tags to send notices to the ubuntul10n group, and the #ul10n hashtag for your related tweets. Remember that these now exist in addition to the existing outreach resources. As before, the main channel for discussion and announcements remains the ubuntu-translators mailing list, but we also want to reach out to everyone who prefers other communication methods. All important announcements will be posted in all of these channels. I've also updated our Ubuntu Translations contact page with all this information. All in all, great ways to stay up to date with key areas of our diverse and vibrant community. I'm sure I've left out many others, do add them in the comments!